Deletions on chromosome 22q11.2 are a strong genetic risk factor for development of schizophrenia and cognitive dysfunction. We employed shotgun liquid chromatography-mass spectrometry (LC-MS) proteomic and metabonomic profiling approaches on prefrontal cortex (PFC) and hippocampal (HPC) tissue from Df(16)A +/- mice, a model of the 22q11.2 deletion syndrome. Proteomic results were compared with previous transcriptomic profiling studies of the same brain regions. The aim was to investigate how the combined effect of the 22q11.2 deletion and the corresponding miRNA dysregulation affects the cell biology at the systems level. The proteomic brain profiling analysis revealed PFC and HPC changes in various molecular pathways associated with chromatin remodelling and RNA transcription, indicative of an epigenetic component of the 22q11.2DS. Further, alterations in glycolysis/gluconeogenesis, mitochondrial function and lipid biosynthesis were identified. 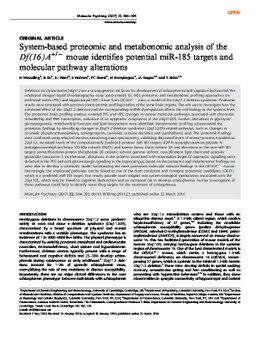 Metabonomic profiling substantiated the proteomic findings by identifying changes in 22q11.2 deletion syndrome (22q11.2DS)-related pathways, such as changes in ceramide phosphoethanolamines, sphingomyelin, carnitines, tyrosine derivates and panthothenic acid. The proteomic findings were confirmed using selected reaction monitoring mass spectrometry, validating decreased levels of several proteins encoded on 22q11.2, increased levels of the computationally predicted putative miR-185 targets UDP-N-acetylglucosamine-peptide N-acetylglucosaminyltransferase 110 kDa subunit (OGT1) and kinesin heavy chain isoform 5A and alterations in the non-miR-185 targets serine/threonine-protein phosphatase 2B catalytic subunit gamma isoform, neurofilament light chain and vesicular glutamate transporter 1. Furthermore, alterations in the proteins associated with mammalian target of rapamycin signalling were detected in the PFC and with glutamatergic signalling in the hippocampus. Based on the proteomic and metabonomic findings, we were able to develop a schematic model summarizing the most prominent molecular network findings in the Df(16)A +/- mouse. Interestingly, the implicated pathways can be linked to one of the most consistent and strongest proteomic candidates, (OGT1), which is a predicted miR-185 target. Our results provide novel insights into system-biological mechanisms associated with the 22q11DS, which may be linked to cognitive dysfunction and an increased risk to develop schizophrenia. Further investigation of these pathways could help to identify novel drug targets for the treatment of schizophrenia.